Tools are important to successful gardening, says Edward Gabrielse of St. Charles. Gabrielse gardens along with his wife, Jane, on an in-town lot surrounding an 1890s Victorian home. In his garage is a workshop where he keeps his tools for woodworking and for gardening, both hobbies of his. “Were very big on the right tool for the job”, he said. Because the soil in his yard can get very compacted and heavy, he uses a power auger attached to a heavy-duty battery-operated drill to dig the holes for planting annuals. “This just works so easily”, he said, explaining that he can plant a whole flat of annuals in a matter of minutes with the tool. Another favorite is a triangular-shaped hoe that the Gabrielse use to dig up weeds around plants in the garden..
“If everyone had a hoe like that, weeds would not be a problem”, he said with a laugh. The Gabrielse have lived in their home for twenty years, and both of them enjoy gardening. Eds woodworking skills http://www.phpaide.com/demos/ContactForm/ are evident throughout the yard: an arbor entry into the side yard, a deck with custom railings on the back porch, and a half gazebo along the side yard. Jane wanted a gazebo, but she said “we didn”t have room for one”, and I said, “Oh, yes we do”, said Ed Gabrielse. Then he proceeded to build a half of a gazebo along a side fence. It”s just large enough to sit in and enjoy the yard, bestenorskecasinos.com and also makes another wonderful place to put planted containers and window boxes. 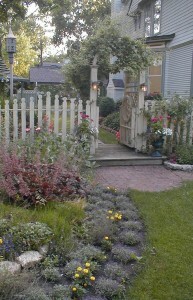 Gabrielse also built a birdhouse that is a replica of their turn-of-the-century home. Ponds are a favorite gardening element of the Gabrielse. They built one in the back of the yard a few years ago, and liked it so much, they added another in the side yard. Each is four feet deep and can overwinter the fish that he stocks them with. Gabrielse uses a trough heater to keep the water open during the winter. In the side yard pond, he built an attractive fountain using a spouting head that he bought at a flea market and surrounded it with brick that he salvaged from a neighbor who found it buried in his yard. Some of the Gabrielse favorite flowers are datura (he grew coral, white, yellow and lavender-colored ones last year) and heliotrope, which has such a great fragrance. Although he plants lots of annuals, he plants plenty of perennials as well, such as rudbeckia, monkshood and liatris. His tip to other gardeners is to use Osmocote, the slow-release fertilizer. It”s easy to put in the ground when you”re planting, and it lasts all season. If there was one thing that the Gabrielse would wish for their garden, it would be more time to spend in it, they say.